Rabbi Heshy Ceitlin with Arkady Samoylov, who had mezuzahs affixed on the home he has lived in for many years. Having mezuzahs on her family’s doorposts has changed Anna Shur’s outlook on Judaism. “It gives me a sense of who I am; it’s a reminder to be thankful to G‑d,” says Shur, who started lighting Shabbat candles regularly and enrolled her 7-year-old son and 6-year-old daughter in Hebrew school after mounting the parchment scrolls, which contain the Shema, the central tenet of Judaism, in plain sight. 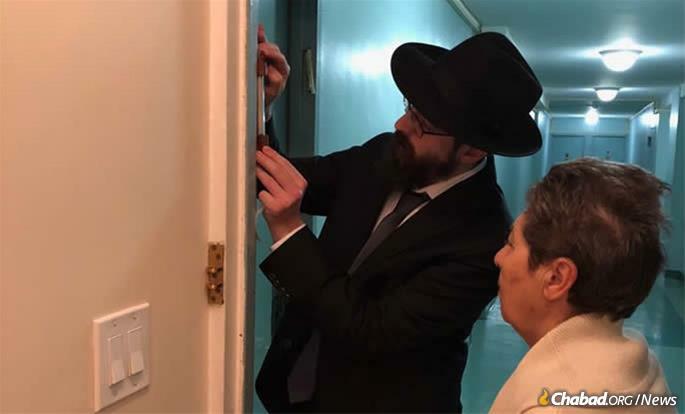 The resident of Brooklyn, N.Y., put the mezuzahs up with the help of Rabbi Heshy Ceitlin, who moved to the area about four years ago as a Chabad-Lubavitch emissary with his wife, Rochel Chana, to join her parents, Rabbi Chaim and Rivkah Brikman, co-directors of Chabad by the Ocean. Shur and Rabbi Ceitlin met when she had Jewish questions she wanted answered after her grandmother died. The rabbi came by and introduced himself, and then mentioned a mezuzah project, which he has been running since the end of 2015. They set a date, made sure her children were home to see it and got started. The mezuzah not only designates a home as Jewish, but is also a symbol of G‑d’s watchful care over the home. It gives her a sense of protection over their residence, says Shur, who didn’t have mezuzahs on her doors growing up. “I never had the opportunity and wouldn’t have known how to go about it,” Shur tells Chabad.org, adding that being able to go to the store and buy a mezuzah isn’t the same for her as knowing how it’s supposed be affixed or the rules around it. “It’s great to have Rabbi Heshy and his wife because every time I have a question, I shoot them a text, and they always have answers,” she says. 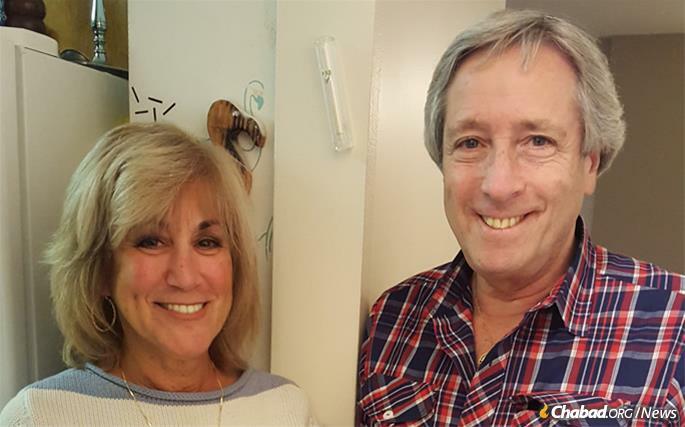 The Ceitlins started a mezuzah campaign at a synagogue appreciation dinner in 2015. They gave out 200 cards for people in attendance to fill out, asking whether or not they had mezuzahs and when they were last checked. Fifty or sixty families signed up right away, and then there were more. Those at a local daycare center point out the establishment's first mezuahs. 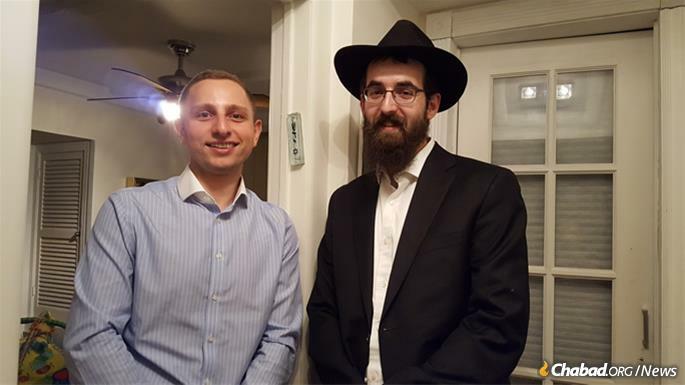 The rabbi was there to put up mezuzahs for Igor Fridlin and his wife, Elaine, when the family—the couple, plus a 12-year-old and nine-year-old triplets—moved to a new house in October 2017. He came back just a few months ago to check that they were still kosher as, over time, letters can fade or the parchment can tear. “We’re all busy with our daily lives—work, kids, everything else—and this is an incredible convenience, to have someone literally at your arm’s reach who can do it, who can offer that to you,” says Fridlin. Michael and Maureen Nelson get kosher mezuzahs on all doors in their home. 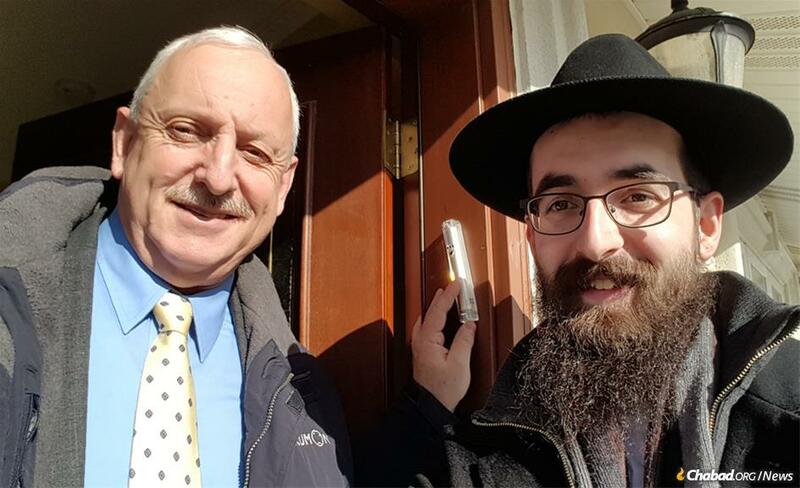 David Krainert with Rabbi Heshy Ceitlin and the newly affixed mezuzah on his Sea Gate home. Russian immigrant Riva Gitlin gets mezuzahs on all the doors of her home. 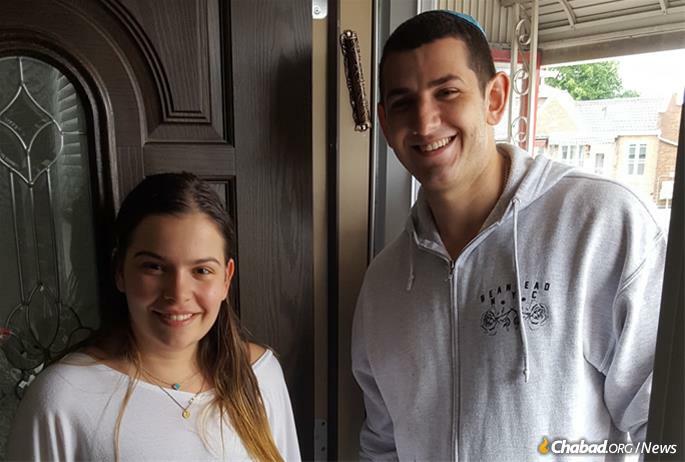 Mitchel and Jasmin Schmargon knew who to call to affix mezuzahs on their newly purchased home in Sea Gate.